The editor of a respected women's magazine in Afghanistan has been sentenced to two years in jail for "blasphemy" after the judge in the case was ordered to imprison the editor by the Ulama Council, the country's leading religious body which is dominated by conservative clerics, according to reports from the Associate Press and regional newspapers like the Pak Times. The editor of Haqooq-i-Zan (Women's Rights), Ali Mohaqiq Nasab (left) was arrested on Oct. 1 after he published articles in two issues of the magazine denouncing the law which makes leaving the Islamic religion a crime, punishable by stoning to death; he also criticized the practice of punishing adultery with 100 lashes, and argued that men and women should be considered by law to be equals. ("In some cases, the testimony of a female witness is considered to have only half the value of a male," the AP noted.) In other words, saying that men and women should be equal under the law and that stoning to death is wrong are "blasphemous" statements for which one can be sent to the slammer for years. Now, do you remember Laura Bush's "crusade" for women's rights in Afghanistan, which was part of the Bush administration's propaganda campaign to convince Americans the U.S. military invasion of the country was justified? Remember how the CIA's puppet choice for president of Afghanistan, the theatrically-dressed Hamid Karzai, was sent to sit next to Laura during the State of the Union (left) and, once elected President, how Karzai the "democrat" was applauded by both Houses of Congress (and both parties) when he spoke to them? Well, guess who ordered editor Nasab (who is also an Islamic scholar) to be arrested? Why, the complaint was made by President Karzai's top adviser on religion, Mohaiuddin Baluch, says the Committee to Protect Journalists, citing a previous Baluch statement to the AP that, ""I took the two magazines and spoke to the Supreme Court chief, who wrote to attorney general to investigate." 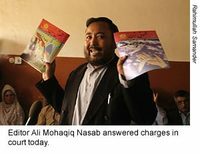 And the presiding judge of Kabul's primary court, Ansarullah Malawizada, told the AP, "The Ulama Council sent us a letter saying that he should be punished so I sentenced him to two years' jail." So, here we have the spectacle, in what Bush & Co. insist on calling Afghanistan's "democracy," of a top aide to the president ordering a courageous editor put on trial for criticizing the barbaric policies of stoning and lashing, and a judge acting on the orders of a group of reactionary clerics and sending the editor to jail because such articles were "blasphemous." Remember all that Bush rejoicing when the Afghanis passed their new constitution? It was drawn up with the help of then-US Ambassador to Afghanistan Zalmay Khalilzad (right) -- now performing the same role in Iraq as the architect of its new Constitution. Well, the Khalilzad-sponsored Afghani Constitution's Article 31 makes it a crime to criticize Islam in any form, and that includes criticizing Islamic Sharia law. And it is under that dictatorial Article 31 that editor Nasab has been put behind bars. » Expect "Fresher Supplemental Results" At Google.com from latest changes.